TEHRAN, Iran -- A spokesman for Iran's judiciary says that around 100 suspects were arrested, with some later released, following an attack on Saudi Arabia's embassy in Tehran. Iran's state TV Sunday quoted spokesman Gholam Hossein Mohseni Ejehi announcing the arrests, which he said took place after the January attacks. He did not give further details. It is unusual for Iran to publicly announce arrests following such incidents. 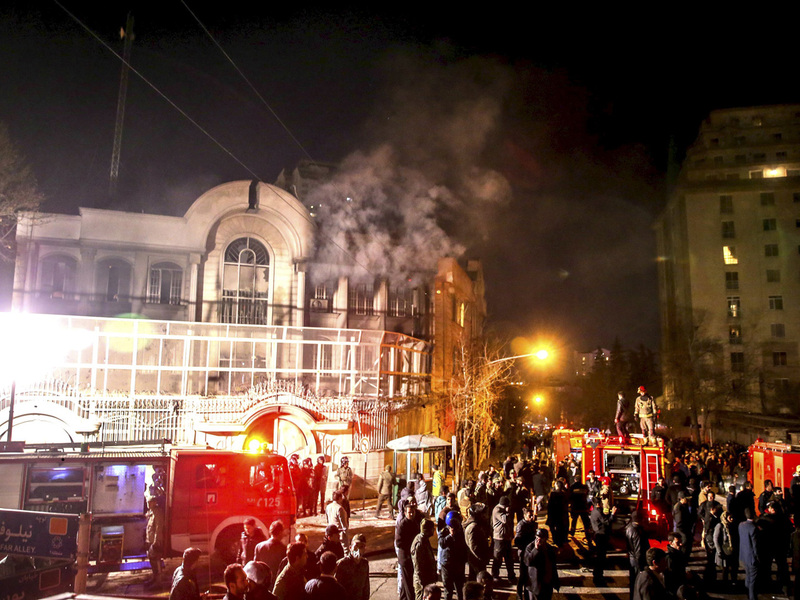 Protesters set fire to the Saudi embassy in Tehran and attacked its consulate in another Iranian city in response to the kingdom's execution of a prominent Shiite cleric on Jan 2. The protests provoked Saudi Arabia to cut diplomatic ties with Iran, escalating tensions between the longtime regional rivals. The tensions began in earnest after Saudi Arabia announced the execution of Sheikh Nimr al-Nimr in the beginning of January along with 46 others, including three other Shiite dissidents and a number of al Qaeda militants. It was largest mass execution carried out by the kingdom in three and a half decades. Al-Nimr was a central figure in protests by Saudi Arabia's Shiite minority until his arrest in 2012, and his execution was questioned around the world. Iran's Supreme Leader Ayatollah Ali Khamenei condemned the execution in a statement on his website afterwards, saying the Saudis were inviting "divine revenge" because al-Nimr "neither invited people to take up arms nor hatched covert plots. The only thing he did was public criticism." Iran's powerful Revolutionary Guard said Saudi Arabia's "medieval act of savagery" in executing the cleric would lead to the "downfall" of the country's monarchy. Sunni Saudi Arabia and Shiite Iran are locked in a bitter rivalry, and support opposite sides in the wars in Syria and Yemen. Iran accused Saudi Arabia of supporting "terrorism" in part because it backs Syrian rebel groups, while Riyadh points to Iran's support for the Lebanese Hezbollah and other Shiite militant groups in the region. In Tehran after the execution, a crowd gathered outside the Saudi Embassy and chanted anti-Saudi slogans. Some protesters threw stones and Molotov cocktails at the embassy, setting off a fire in part of the building, said the country's top police official, Gen. Hossein Sajedinia, according to the semiofficial Tasnim news agency. He later said police had removed the protesters from the building and arrested some of them, adding that the situation had been "defused." CBS News correspondent Holly Williams reported at the time that 42 people were later arrested for the incident, though Iran named the street where the embassy sits in honor of Nimr Al-Nimr. "It is unjustifiable," he said in a statement after the incident.